We have a very special Family ‘Monsterchef’ competition happening in the morning of Tuesday 23 October. It’s a family version of our regular Junior Masterchef, so everyone can join in. We have space for a maximum of 30 people, and you must sign up on Monday 22 October to make sure you have a place. The competition will be held in Saturno Square from 10.30am to 12.30pm, and each team must have at least one child aged 4+. 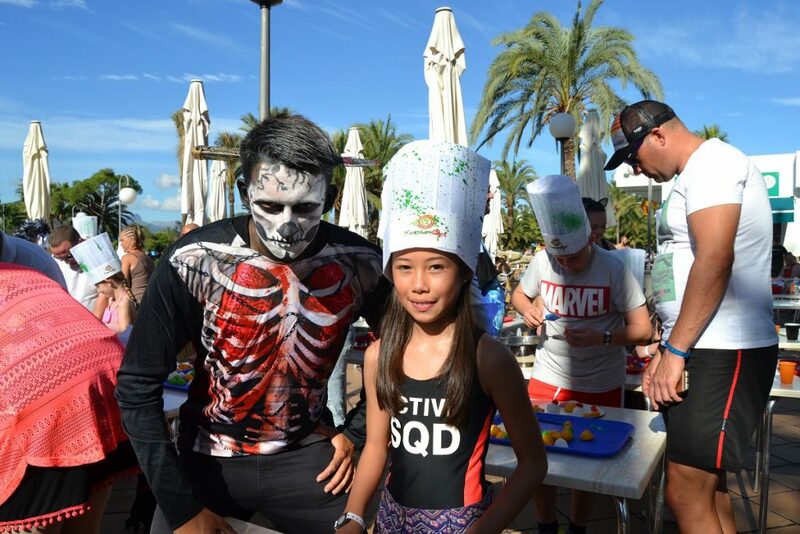 Your team will prepare a monster face using sweets and spidery popcakes.The winning family will have their photo in the Club MAC newspaper the next day and will enjoy cake and champagne in the restaurant in the evening. Spooktacular! Halloween fun for our teenage and adult guests features a Halloween Express spooky treasure hunt around the hotel complex. A maximum of eight people per group (minimum of two) can take part. Each group must have at least one adult who is over 18. You’ll be tasked with looking for clues around the hotel complex, including entering the ‘Room of Terror: House of the Dragons’. Sign up on the day before and meet at 10.30am in Jupiter Square on Tuesday 23 October for lots of terrifying fun. The prize on offer is an excursion for four people, which will be chosen from a list of options at Reception. Later in the day, we’re holding a pumpkin carving workshop for all the family to take part in. With a maximum of 30 places, you’ll need to sign up the day before. The fun starts at 3pm in Saturno Square, and you have two hours as a family team to create your very own pumpkin. Each team must have at least one adult to safely use the knives. For adults and teenagers, we have some ‘undead’ sporting activities in the form of our Zombie Tournament and Horror Archery. Adults and teens over 14 years old can play. At 7pm, we will host a Trick or Treat fancy dress parade. Meet us at the Circus stage, with your kids dressed up and ready to go and bring a bag ready to fill with sweets. From the stage, the parade will wind its way throughout the resort. Kids can collect candies at Jupiter and Saturno bars and Marte Reception. By 8pm, they will be back at the Circus stage ready for their own horror-themed mini disco. The disco will have lots of music and games, as well as dancing to some ghoulish favourites. After our usual 9pm bingo, there will be a Horror Night for all the family. It’s your chance to get dressed up for Halloween and enter the costume contest. You’ll need to bring your own costumes from home for day time and night time entertainments. Write a note before you pack your suitcase so you don’t forget to bring your costumes with you! There are two separate sign-up listings, one for children aged four to 13, and the other for those aged 14 years upwards. Remember to sign up before the party. The lists will be open at the Guest House for you to sign-up on Monday and Tuesday. And a warning to parents of little ones that might be easily scared – our entertainment team will be dressed up too. And they’ll be filming and taking photos. There will even be a Facebook Live shout out and you can win a personalised gadget. It’s going to be so much fun! If you haven’t booked to stay at Club MAC Alcudia yet this year, you can still bag a last-minute stay before the end of the season. Book directly with us on the phone or online and you’re guaranteed the cheapest option. We look forward to seeing you for frightening fun and games!